Vietnam sees around 24,000 new lung cancer patients and nearly 21,000 people die of the disease annually. The information was given by Le Van Quang, deputy director of K Hospital, at the Vietnam France Cancer Conference held in Hanoi on November 7. So far this year, the number of lung cancer patients in Vietnam has stood second just behind liver cancer. According to Quang, most lung cancer cases are often diagnosed late, so patients have to use radiotherapy. People aged more than 50 years old are the most vulnerable to lung cancer, but the disease has tended to attack younger people. Quang cited a 15-year old teenager who recently died of this cancer after two-year treatment. The patient was a victim of secondary smoking. He also mentioned another patient aged 25 who is being treated at a hospital in Hanoi for the disease. Like the teenager, the man contracted cancer due to frequently inhalation of smoke in his family. The doctor noted that the majority of lung cancer cases are related to smoking. He advised people aged over 50 to take lung cancer screening once a year. Smokers should do this more regularly. Prof. Dr. Tran Van Thuan, director of K Hospital in Hanoi, said that cancer treatment methods have much progressed, which has even helped late-diagnosed patients to lengthen their life to 5-6 years. The second Vietnam-France conference on cancer allows participants to share experiences, provide updates on the latest research on lung cancer risks prevention, advanced diagnosis and treatment methods. Participants also discussed instructions for diagnosing and treating lung and colorectal cancers, patient classification, radiotherapy and chemotherapy methods and geriatric cancer. 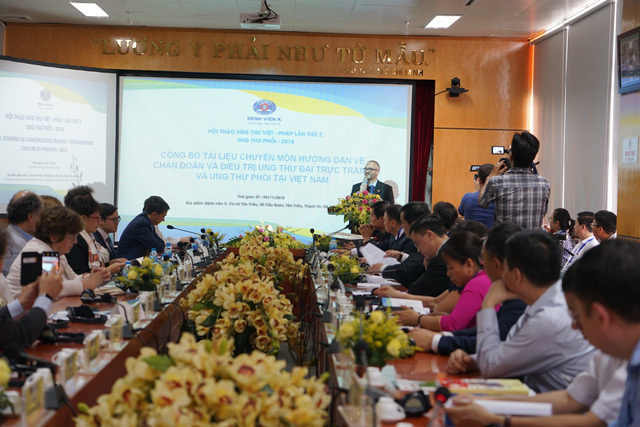 The conference also provided an important foundation for the development of Vietnam’s national lung cancer strategy.